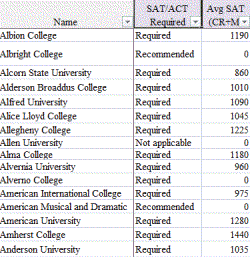 Planning on using a spreadsheet to track your college search? copying from college search sites anyway? graduation rates, and so on for each college as you decide to include it in your search, you could already have the information entered and be focusing on adding the unique characteristics as you find them. How much more useful would your college search spreadsheet be if you already had the following information entered for every four-year institution with at least 500 full-time undergraduates? The spreadsheet above shows all of the actual columns included in the spreadsheet for a selected number of schools. The “Definitions” tab lists all of the variables and their definitions. This data is extracted from the Integrated Post-Secondary Education Data System which is basis for the College Navigator website. Applicants-Total % Freshman Receiving Other Federal Grants Mechanic and Repair Technologies/ Technicians. % Applicants Men Avg Amount of Other Federal Grants for Freshman % Mechanic and Repair Technologies/ Technicians. This data is extracted from the Integrated Post-Secondary Education Data System which is basis for the College Navigator website.You can have a spreadsheet with this data already entered, formatted as tables, and a tab for a pivot table for only $42. That’s what it costs to just take the SAT. Having the data already entered means that you can use it to actually search for colleges, not jut track colleges you have already found. Instead of entering graduation rates, admission rates, average cost of attendance, or 75th percentile test scores you could be searching on them. The following video is a short demonstration on how you could use the data instead of spending time entering it. 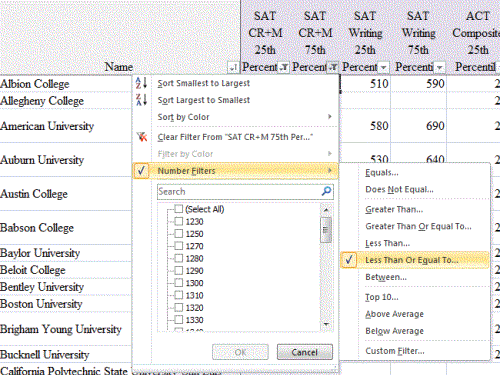 For the cost of a single college application, you could be using your spreadsheet to narrow your college search rather than looking up the data from websites to enter.For $42, you get an Excel spreadsheet (compatible with PC version 2007+ or Mac 2011) with over 1,500 public and non-profit colleges and 200 variables and a 60 day money back guarantee–no questions asked. So what are you waiting for? Wouldn’t you rather be using data than entering it?